What do you get when you take a roadtrip to one of Melbourne’s hippest cafe’s? A damn fine coffee. This morning we headed to St Edmonds. Housed in an understated building in Prahran, it’s a cosy place to sit and devour newspapers as well as caffeine hits. 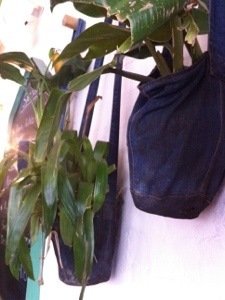 And if you take the time to gaze up from your coffee heaven trance, you’ll spy up-cycled denim jean pockets hanging on the wall. They’re not for tips either, rather they’re pot plants that I think are as funky as the clientele. I’m thinking these would look at home in the barn for a Spring party we’re thinking of hosting. I’ll be keeping my eyes peeled for more ideas.